It is another rainy Bank Holiday so have changed my plans. I was going to go get some chuck food then do some weeding……NO, its chucking it down and not with hens. So instead have decided to see how Riach people in the Brighouse area link in with mine from good old Morayshire. A few minutes after my search began I came across a few people researching the same line and started to verify their work by looking at census returns, BMD entries etc. Well, the good news is, but some would say bad news, is that yes I am related to the Brighouse Riach’s. A couple of cuppa’s and a very large bowl of strawberries and creme fraiche later I have the family linked in to mine up to and around the second world war. One of the men born around 1923 triggered the old brain cells and got me thinking. Not a pretty site I might add! Years ago I bought a book giving the names of men and women from the Spenborough area who died in WW2 and who served in that war. There were a few Riach names and they will need further work. There is however, a James Riach who lived in Brighouse. So, who was James and how does he link into my tree ? James is one of my 6th cousins. He was born in May of 1871 in Bellie, Morayshire, the son of John Riach (1847) and Susan Goulder (1850). John was a Police Constable in the 1881 census and by looking at the places his children were born, he seems to have come south of the border between May of 1871 and 1873 when he and his wife are having children in Fewston. Susan according to the 1911 census wrote she had been married 41 years, given birth to 15 children and 11 of which were alive in 1911. James had died a few years earlier so the entry had been crossed out by the enumerator. Susan had answered the questions asked as there was no note saying that a widow/widower had no need to answer that section. It is good to see those questions answered from a family history point of view. Back to James, the 1911 census, the good old 1911 census has transcribed his place of birth as Forhibers, but Fochabers can be made out on the original document – it makes you wonder where the census was transcribed. Anyway, James married Ada Louisa MacAulay in the Spring of 1894 in the Halifax Registration District. James and Ada went on to have 3 children, Blanche, James and John. Ada married William Sutcliffe ; James jnr married Elsie A Norcliffe and John married Doris Jackson and went to Australia after 1939. On 24 July 1912 James signed papers to put him on the Special Reservists list for the Army. He was found to be 5′ 5″ tall with a 34 ” chest with a 2″ range of expansion. His physical development was ‘good’ and so was his vision He gave his trade as that of Mechanic, employed by J Sharp and living at 35 Birkby St, Wilson Road, Wyke. He declared his age as 34 years. He was given the no. 1442 and served as a Private in the West Riding Regt., Pioneer Corps being struck through and he signed his name in a good clear hand. James on one of the forms gave details of his wife and children, his parents and siblings, including addresses for them all – what a fantastic piece of information. James embarked from Folkestone on the SS Invicta on 14 April 1915. By 10 July of the same he he was appointed unpaid L/Cpl and just over a month later on 15 August 1915 he was Killed In Action. On the 14th of January 1916 the War Office, st James’s Park sent a memo to the Officer in charge of the Territorial Force Records, York ref: E/128920/1 (Accounts 4) requesting that the personal property in their possession belonging to No. 1442, Lance Corporal James Riach 1/4 Battalion West Riding Regiment be despatched to Mrs Ada Louisa Riach, 25 Birkly Street, Wilson Road, Wyke, Bradford. The memo also requested that any medals in their possession now or at a later date also be despatched to Mrs Riach. Ada L Riach was sent on 2 July 1919 a form requesting she complete and return so that the ‘Death Penny’ could be forward to her. Ada on September 25th 1919 signed a receipt for a medal, on January 24th 1921 she signed another receipt for medal awarded to her late husband. Ada was also eligible for a 21/- a week pension for herself and her two children with effect from 28 February 1916. James served 3 years 52 days in the army and was awarded the 1914 – 1915 Star, The British War Medal and the Victory Medal. L. Cpl 1442, Riach J, of the West Riding Regiment rests in peace with 47 Officers and Men in Colne Valley Cemetery – 30 of those men are from the West Riding Regiment. Colne Valley Cemetery is at Beozinge, just north of Ieper on the N369 towards Diksmuide. 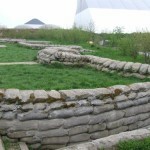 For most of WW1 Beozinge faced the German front line. 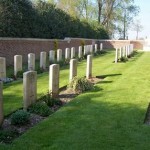 The cemetery was begun in July/August of 1915 and was in use until around February of the following year. Note:- Ada remained in the Bradford area and died in the June Qtr of 1958 aged 86. This entry was posted in General and tagged 1911, Army, casualty, census, conflict, family, memory, policeman, records, Regiments, transcription, yorkshire on May 30, 2011 by carol.